The Now Playing Podcast Fall Donation series runs through December 31, 2016. 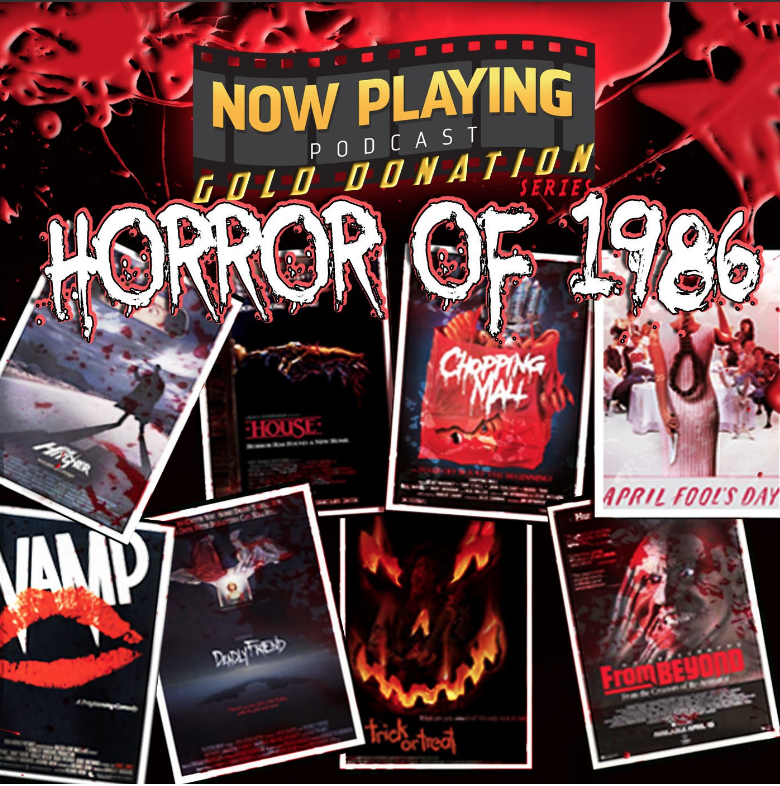 Now Playing Podcast has a thing for 1986. The proof is in the archives. If you count nine of the films on tap for this fall’s donation drive, you’ll find the hosts have reviewed at least two-dozen pictures that are celebrating their 30th anniversary. That includes Howard the Duck, Aliens, The Golden Child, Transformers: The Movie, – man, 1986 was the best year. If Now Playing Podcast ever reviews Solarbabies I’ll die happy. In a Venganza Media Gazette Q&A, hosts Arnie, Stuart, and Jakob talk about that year in movies, and why it’s one for the ages. Venganza Gazette: What do you remember about 1986 and that huge summer at the movies? Jakob: By 1986 I was just old enough to start to really understand that some movies were good and some were bad. 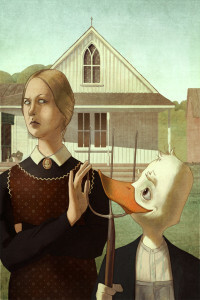 I remember begging my parents to take me to Howard the Duck. This was the first time I remember feeling hyped for a film — it was from George “Star Wars” Lucas — and then coming out of the theater thinking, “What’s this strange new feeling? I’m disappointed with that film. Movies can be bad?” Now I can see the man behind the curtain as opposed to being at a point filled with all the emotions and memories that come from discovery. Arnie: It was the year I started to go to the movies every week of my summer vacation, and often more than once. I was 11 years old and starting to read behind-the-scenes articles and magazines, novelizations and source material. If you read my 40-Year-Old Critic review series on the Gazette you know movies were always in my blood, but in 1986 they also became the air I breathed. So we have a perfect storm–the studios producing big franchise films, and me being very nostalgic of that period having seen so many of these with friends and family. Stuart: I had seen half of those [donation drive] movies as a child the year they were released and had a strong sense of nostalgia reflecting on them – remembering the theater I went to, my thoughts as a kid. Every decade has its own flavor, and the 80s was certainly an era that excelled at producing franchise ready summer entertainment that put big special effects and youth centric storylines at the forefront of moviemaking. For me 1986 was the greatest concentration of that type of film. Arnie: If you look at the  calendar, from May 9 to August 22, almost every week had a big blockbuster or franchise film release. Short Circuit, Top Gun, Poltergeist II, Ferris Bueller’s Day Off, Invaders from Mars, Karate Kid II, Psycho III, Aliens, Nothing in Common, Friday the 13th Part 6, and even Maximum Overdrive – Stephen King himself being a movie franchise. Stuart: Everyone seemed to be chasing after the Spielberg aesthetic and box office. Venganza Gazette: Can you compare it to another year or era in film? Stuart: The 1990s was a return to that 70s emphasis on director driven stories and provocative visions. But the millennium has definitely brought us back to a 80s blockbuster mentality. I think 2012 was just as big a year for Now Playing as 1986 because we saw new installments to big long franchises like Marvel, Batman, Alien, not to mention the kickoff to new series like Hobbit and Hunger Games. Venganza Gazette: What did you think about going back 30 years for the 2016 donation drives? Stuart: to have the opportunity to go back and see the influential films of my youth is a great way of charting my own personal growth, as well as the evolution of genre films. I’ve reached an age where my childhood feels like a very distant memory. Jakob: Especially the sci-fi series. I think many of our listeners had similar feelings — why else would they be so excited to listen to us talk about Space Camp? The horror series is a little different because I was too young and my parents would never allow me to see these films when they were released. But there is still that nostalgia – that era with the VHS box art. I remember looking at House and April Fools Day and just thinking they must be the scariest movies ever! Stuart: Even the turkeys and one-off curiosities not deemed box office successes are fun to go back to because they all reinforce the virtues and values of the era’s film movement. Jakob: I guess I’ll find out if these films can live up to their great poster art. Venganza Gazette: Any chance of a sci-fi or horror of 1987 series coming? Venganza Gazette: Do you think it’s important for younger filmgoers to go back and see films released before they were born – and not just the classics? Arnie: Important isn’t a word I would use. I don’t spend my time seeking out obscure films from the 1920s through the 1960s – it’s the classics that are important to see. Jakob: I think anyone who cares about film as an art form and an ongoing story – both from a technical viewpoint and humanities – will want to search out films from any era. The concept of “canon” or “classics” are useful as starting points. But the “losers” can be just as interesting as the winners of film history. Arnie: There is a lot of fun to be had in films 20, 30, and 40 years old, sometimes because the movies are great, and sometimes because they’re now so out of date or fantastically awful. God knows not every film we’re covering is one that deserves preservation in the Library of Congress’ vaults. I’d simply hope that younger film enthusiasts are open to older films. Stuart: It’s often been lamented that there is nothing new under the sun, and all ideas have been done before. But I see that as the reason why someone would bother to look at old films. I find it fascinating to see how previous generations of filmmakers tackled the same genres and storylines. Arnie: I have found some great enjoyment in films before my time, many of which I was initially resistant to see – The Maltese Falcon and Curse of the Fly for example. Jakob: Stuart’s excitement for director Samuel Fuller convinced me watch his movies from the 1950s and 60s. Many of these old, B-movies by Fuller are so brazen in their politics and viewpoint that it is hard to forget them. Stuart: While some film grammar from certain eras may seem obtuse and off putting to modern audiences, I’ve found that almost every decade excelled at at least one kind of art form (be it musicals, romantic comedies, or Westerns). Going back to the ’80s is about watching a generation hit its stride with horror and science fiction. Jakob: If someone’s top 10 is a list of blockbusters from the last five years, they’re probably pretty boring. Don’t be boring. Don’t let someone else define your classics, greats, and canon. The Now Playing Podcast 2016 Fall Donation Series runs through December 31, 2016 and features three retrospectives: The Fly, Horror Movies of 1986, and the Re-Animator series. 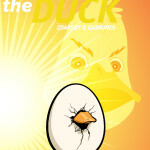 New Ongoing Series Launching This March! New York, NY – February 6th, 2015 – He’s a person just like we are….only he’s also a duck. This March, that fine fowl returns to the pages of Marvel Comics in HOWARD THE DUCK #1 – the new ongoing series from writer Chip Zdarsky (Original Sins) and artist Joe Quinones (Savage Wolverine)! Go Quackers For The First Ever HOWARD THE DUCK #1 EVOLUTION OF HOWARD VARIANT! From the mad geniuses who brought you the Ant-Man #1 Shrinking Variant comes the one of a kind HOWARD THE DUCK #1 EVOLUTION OF HOWARD VARIANT! Howard the Duck writer Chip Zdarsky lends his inimitable style to this completely unique cover, showcasing Howard in different stages of life! Be there for the birth of that fabulous fowl. Marvel at his rebellious teenage phase. Witness his sad and valiant end. Completely unique and individually numbered, each cover features one of seven different evolutionary stages, each rendered at a different and unique size – large, small and everything in between! Fans lucky enough to get their hands on this highly collectible variant cover will own a unique piece of Howard history as no two variants are alike! 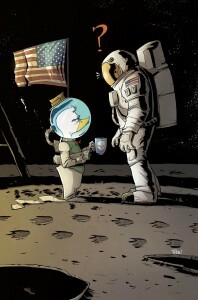 The Marvel Universe’s most satirical sort returns to work this March in HOWARD THE DUCK #1, the new, in-continuity ongoing series from Chip Zdarsky and artist Joe Quinones! Be there when Howard ventures through the Marvel Universe, trapped in a world he’s grown accustomed to as he takes on She-Hulk, the Black Cat, and mysterious forces from outer space! Maybe even a Guardian of the Galaxy or two. Be there for Howard’s triumphant return and don’t miss your chance to own this truly unique, one-of-a-kind variant before they’re gone for good! 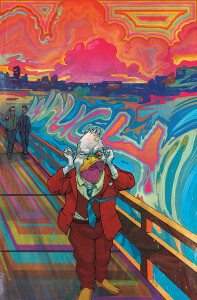 Run, walk, swim or flap your way to your comic shop this March for the HOWARD THE DUCK #1 EVOLUTION OF HOWARD VARIANT! 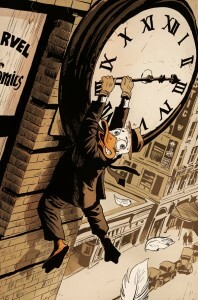 January 23, 2015 Posted by Arnie C | Comic Books, News	| Comics, Evolution, Howard the Duck, Marvel Comics, News, Press Release, Variant Cover | Comments Off on Go Quackers For The First Ever HOWARD THE DUCK #1 EVOLUTION OF HOWARD VARIANT!